Last week I traveled to Osogbo, at the last hour of packing my luggage I decided to toss in my GTB internet banking token. I might need it to make third party bank transfers. Unfortunately, it rained that day and manyhow the water sipped into the side of my luggage, the part I kept the token. I didn't notice until four days later, I needed to load a Cellulant bulk SMS account. Unknown to me, the payment page now requests for an OTP (one time password from the token). I smiled at myself, believing I'm covered. 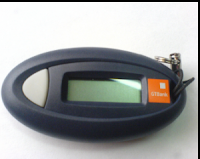 I brought out my GTbank token and pressed the big white rubber button, nothing showed, no digits on the display. I pressed it again and again and again, still no digits. Then, I put on my most optimistic mind, went to my bag and brought out the screwdriver I exclusively use on my laptop (yeah, my beloved Sony VAIO, a story for another post). I took apart the token, tried all my technical tricks on it - hit it like an old TV, spread it out like a dead battery, tune it slowly like an analog radio. No result. I finally gave up (my most expensive habit, newly acquired after the lack of it nearly ruined). I went to the nearest Guaranty Trust Bank (in Osogbo) and got a replacement same day for a token of N2,000. So that was how I got a replacement. But to make it work, you'll wait for 24hrs, then login to your online account. You'll get a prompt to link the new token to your account by entering the number at the back of the token. Do this and you're set.